The HP C 3125 is capable of producing great quality printouts. After some time your HP C3125 will polish off its printer ink, and then you'll soon discover that brand new HP C3125 ink is generally seriously expensive. Thank goodness you have no reason to worry about forking out the high fees you'll see on the high street because now at Cartridge Save you can pick up all the HP C 3125 cartridges you will want at very low prices. Save cash on your ink by buying with Cartridge Save! Don't pay high prices for a C-3125 original cartridge or C3125 compatible ink in the high street when it is much more simple to save a ton of cash ordering online with Cartridge Save. Get one hundred per cent peace of mind when you purchase your PhotoSmart C3125 ink cartridges from us seeing as everything is underwritten by a straight forward money back guarantee. Don't forget to take into account that each purchase also comes with free delivery, mostly delivered to your door the next working day! 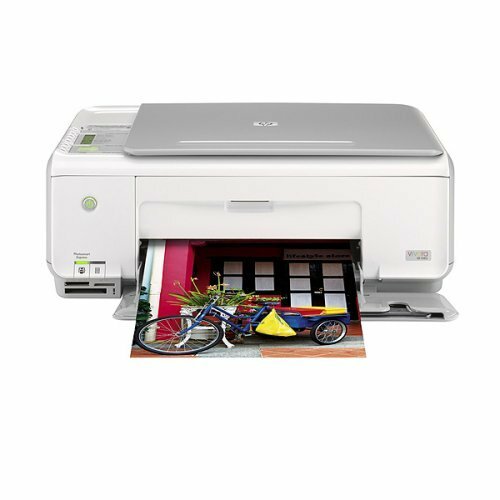 The HP Photosmart C3125 delivers top quality printing, scanning, and copying jobs. It has a monthly duty cycle of 3000 pages and features easy-to-use buttons for specific tasks. It also features memory card slots and supports borderless printing. Connectivity is limited to USB. The printer lacks essential features, including a USB port for direct printing from cameras. The HP Photosmart C3125 features a flatbed scanner on top and is covered with a lid. There is a control panel beside the scanner, and the printer serves as the base. The paper tray has a maximum capacity of 100 sheets and the output tray can handle 50 sheets. The HP Photosmart C3125 is also capable of printing on different media, including transparency films, labels, cards, and envelopes. Get high-quality photos and laser-quality documents minus the hefty price with the HP Photosmart C3125. This printer is compact and is ideal for homes and small offices. It has convenient memory card slots that allow direct printing. While it's reliable and economical, it does not have a fax feature and Wi-Fi connection. Unlike other all-in-ones, the HP Photosmart C3125 does not have an LCD display and does not support networking for workgroups.